AISE2019 will be a busy, packed couple of days on June 9 & 10, 2019. Then InfoComm starts on the 12th. BUSY week, right? Bring the family! Come in a few days early, or plan on staying a few days after AISE and InfoComm. We’re in Orlando! AISE is across the street from Universal Studios Orlando. Right near Disney World, Sea World, and much more! More than a dozen golf courses near by. Dining, dancing, and other entertainment abounds here! Below are just some of the highlights. There is MUCH more to be discovered in beautiful Orlando. Average temperature in June is 90 degrees Fahrenheit during the day, and 73 in the evening. Traffic at Disney World is generally light at the beginning of the month. Heavier on weekends. Click on the map above to go to a general page with links to attractions in and around Orlando. 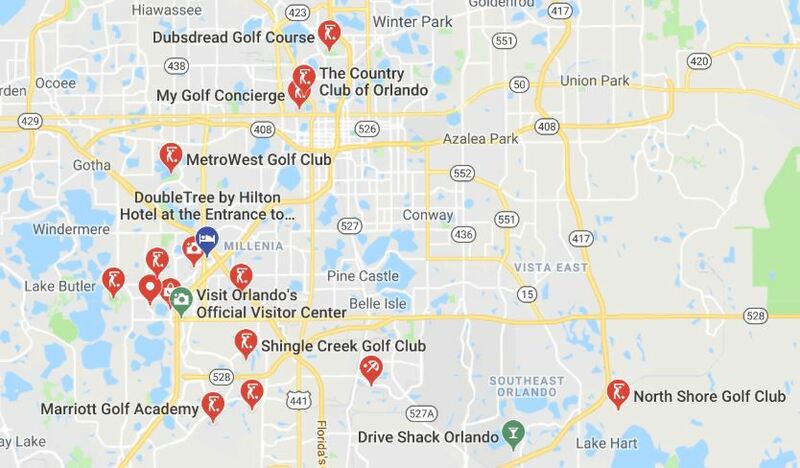 Click on the map above for a guide to golf near our hotel in Orlando! ALMA will be holding and participating in some social gatherings and activities before, during, and after AISE2019. Keep watching here for more information. June 8- 5PM: Student & Educator Launch Pad reception. Casual social gathering to help our student members and educators to connect with our Corporate and Individual Members. No charge to attend. All are welcome! Location at the hotel to be announced. June 8- 6:30PM: President’s Dinner. A long standing tradition that just keeps growing! All attendees and exhibitors are welcome to a purely social and casual evening of dinner and libation. No charge to attend. All attendees are responsible for their own food and drinks. Location at the hotel to be announced. June 9- 6:30PM: ALMA International Annual Banquet. Our gala celebration of industry luminaries and a celebration of comradery. Included with your purchase of an All Access Pass, or can be purchased separately in advance. Meet and greet at InfoComm. Day/time/location to be announced. Make your reservations at the beautiful DoubleTree by Hilton at the entrance to Universal Orlando. Go online to make your reservations HERE. Use Promo Code ALM to get the special group rates. Deadline to get our special LOW accommodations rate is no later than May 15, 2019 to get the special rate of $129 per night plus tax with NO resort fee.